Training and life at Huntingdon. Life in General 11/9/1914 - 'Flettonian, ' of the Hunts. cyclist Battalion, writes ' The Huntingdonshire Post' said, 'the Peterborough contingent have received 1/2cwt, of cakes from the ladies at home.,' I should like to say the two Fletton Companies which are stationed at Withernsea did not receive so much as a cake, and if they are not 'The Peterborough Contingent' who are? The only gift of the kind we have received was a very welcome hamper of plumbs from Mr. Howard Coote. 9/10/1914 - Shirts and Socks for Hunts. Cyclists - Through the kindness of many friends in Huntingdon, Godmanchester, Alconbury, Buckworth, Buckden, Chesterton, Conington, Great Stukeley, Haddon, Holme, Water Newton and Weston it is hoped to send off a large consignment of shirts and socks to the headquarters of the Hunts. Cyclist Battalion to be distributed among A and B Companies. 21/11/14 - At the soldiers Rest [Wesleyan School], Huntingdon, on Wednesday evening Mrs. Beckly gave an address and a pleasant evening passed in songs and recitations. The Hunts. Cyclists were well represented. 6/2/1915 - Cyclists' Smoking Concert - Another capital Smoking Concert was held at the Cyclists' Canteen at Huntingdon on Wednesday, several representatives of the Yeomanry assisting. Those contributing to the programme were: - Corporal Hancock, Corporal Wilkinson, and Pte. Mason, Pte. Bowden, Corporal Boyer, Pte. Conquest, Pte Cade, Lance-Corpl. Pridmore, and sergeant Major Grover [Cyclists], Trooper Hunter, Trooper Metcalfe, Lance Corporal Baker, Corporal Smith, and trooper Ray [Yeomanry]. The accompanists were Corporal Rimes, Bandsman Woods and Lance-Corpl. Powditch. The Cyclist band gave several excellent selections. 30/4/1915 - The military authorities have placed the miniature rifle range at the Cyclists' headquarters at Huntingdon at the disposal of the Volunteer Corps, where shooting practice will take place on Thursday evening. A large number continue to make good use of the open-air range behind Messrs. F. B. Thackray and Co's works, on Wednesday and Saturday afternoons. From a local newspaper of unknown source - 25/6/1915 - Cyclists want table games - The Cyclist Canteen at Huntingdon has been re-opened under the charge of Sergt. Hall. At present the men have very few table games at their disposal, and would be glad of gifts or loans of draughts, chess and domino sets. The canteen is much appreciated by the men. It is opened from 8:30 a.m. to 10 a.m., from noon to 2 p.m., and from 4:30 to 9.30 p.m.
21/9/1915 - The soldiers' Home at Trinity Church, Huntingdon, continues to be well patronised, every comfort being provided for the men in Khaki. A large room is set apart for reading, writing and games and another serves for refreshments, which are managed by a Committee of ladies. 17/12/1915 - With the object of providing materials for the Huntingdon War Working Party, a whist drive on a big scale was held at the Hunts. Cyclists' Recreation Room on Wednesday. There was a large attendance, including many men in Khaki. 4/2/1916 - Forty-five members of the Montague Club, Huntingdon, are serving with the colours. One has been killed in action, and one died at Filey. From a locally printed newspaper dated 9/6/16 = Departure of Cyclists. The Huntingdon Cyclists have had a rare send off on Saturday, when they entrained for Yorkshire and Lincolnshire to join the County Battalions. The boys were in high spirits, and friends gathered in strong force to wish them luck. It was a keen disappointment that “Jack” the regimental mascot, was left behind. The dog, too, was very reluctant to stop, and it was only by force that he was kept out of the train. Institute and Buildings. From a locally printed newspaper dated 28/8/14 = Soldiers institute at Huntingdon. The provision of a place of recreation and refreshment for the Territorial's at Huntingdon has been much appreciated. The premises formerly used by Messrs. Murkett Bros. were well adapted for the purpose, and the Rector with the assistance of a number of voluntary helpers has made them very comfortable. Games are provided, and facilities given for reading and writing. A large number of papers and periodicals have been given. Books and magazines especially those which are freely illustrated, are much appreciated by the men. Those who have old illustrated papers by them cannot do better than send them to Soldiers Institute in High Street. The Wesleyan School has also been placed at the disposal of the Territorial's for the purpose of reading and letter writing, and similar facilities are provided at the Old Grammar School. 21/9/1915 - The soldiers' Home at Trinity Church, Huntingdon, continues to be well patronized, every comfort being provided for the men in Khaki. A large room is set apart for reading, writing and games and another serves for refreshments, which are managed by a Committee of ladies. Picture palace Commandeered - The Central Cinema, at St. Ives, was on Tuesday taken over by the military authorities for the accommodation of Territorial's. Mr. Reach had been informed last week the hall would not be taken except it was urgently needed. Some inconvenience has been caused, but Mr. Reach, has been able to secure other premises in Station Road. 14/1/1916 - There was a very large company at a dance held at the Cyclists' Recreation Room, at Huntingdon, on Wednesday evening. The proceeds are to provide materials for the War Working party. 11/12/1914 - Hunts. Cyclists Headquarters - Considerable alterations are being carried out at the Cyclist headquarters at Huntingdon to adapt them to the requirements of the Battalion. A private room has been provided for the officers. The formation of the Battalion has meant an immense amount of clerical work. Further facilities for miniature rifle shooting practice are to be provided. 7/8/1914 - To provide for the Territorial's - To meet the requirements of the Hunts. Territorial's, the tradesman of Huntingdon were called upon by the Town Crier, acting on the authority of the Mayor, to keep their places of business open on Wednesday afternoon. 9/1/1915 - A commodious recreation room for the use of the Huntingdon Cyclists has been erected. A committee of officers and n.c.o. 's has been appointed, and it is hoped to make the recreation room extremely popular. Col. Stanley is very keen that the men should have plenty of reasonable recreation after their duties are completed. 1/11/14 - At the soldiers Rest [Wesleyan School], Huntingdon, on Wednesday evening Mrs. Beckly gave an address and a pleasant evening passed in songs and recitations. The Hunts. Cyclists were well represented. 25/6/1915 - Cyclists want table games - The Cyclist Canteen at Huntingdon has been re-opened under the charge of Sergt. Hall. At present the men have very few table games at their disposal, and would be glad of gifts or loans of draughts, chess and domino sets. The canteen is much appreciated by the men. It is opened from 8:30 a.m. to 10 a.m., from noon to 2 p.m., and from 4:30 to 9.30 p.m. 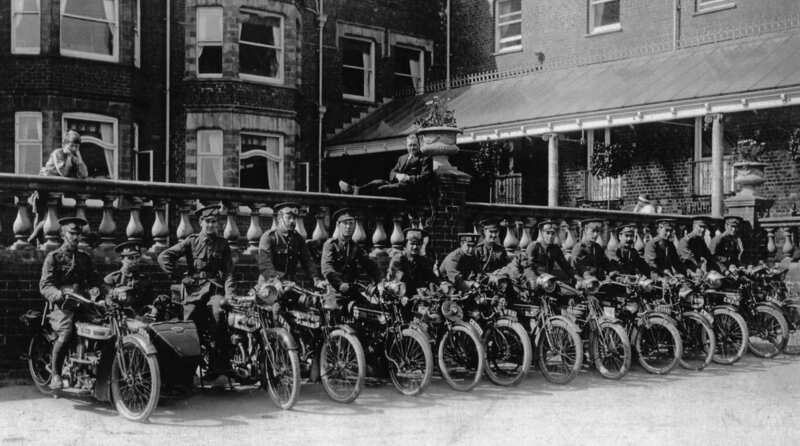 The Motor Section of the Huntingdonshire Cyclist Battalion in a display at the rear of the Bridge Hotel, Huntingdon. This hotel was used by the officers of the H C B as it was only a short distance from their Head quarters in St. Mary's Street. Many thanks to Martyn Webster for providing a copy of this magnificent photograph of the HC B.